Senior Conservation Manager[/caption] Late in October, Nature Canada’s Ted Cheskey led a workshop session on conserving Canada Warbler on its northern breeding grounds with forest company representatives and biologists as part of a larger workshop on birds and forest management hosted by the Boreal Avian Modelling Project (BAM), supported by the Sustainable Forestry Initiative. The workshop was in Edmonton, and as a result was mainly attended by representatives from companies operating in western Canada. Nature Canada was delighted to be able to support the participation of Liz Kejick of the Lac Seul First Nation in northwestern Ontario. Big forestry operations occur widely on the traditional lands of First Nations, some of which operate their own forestry operations, but most of whom rarely have the capacity to participate in initiatives like this one. The fact that Liz was the only First Nation representative at the workshop underlines this point. 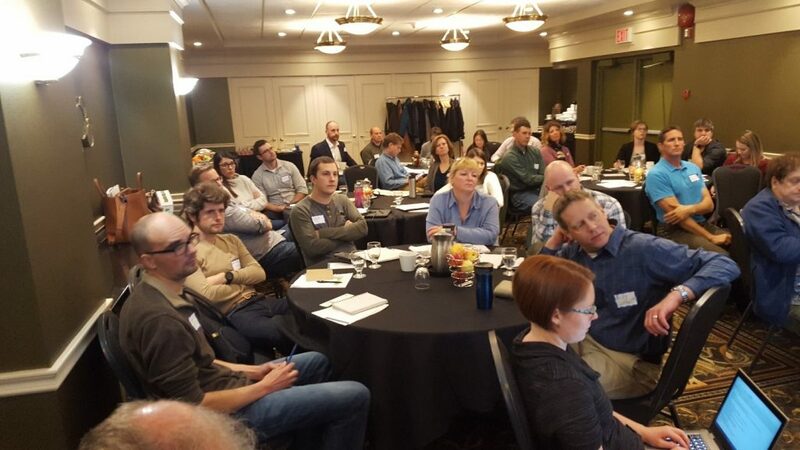 [caption id="attachment_35561" align="aligncenter" width="749"] Participants at Birds and Forestry Workshop in Edmonton this fall – photo by Ted Cheskey[/caption] My take away learning was that there are already many logging companies that incorporate Canada Warbler conservation practices into their daily operations in western Canada. Many conduct pre-operational surveys, for example. BAM’s interest in getting the scientists and forestry companies talking was in part to apply the BAM products (e.g. 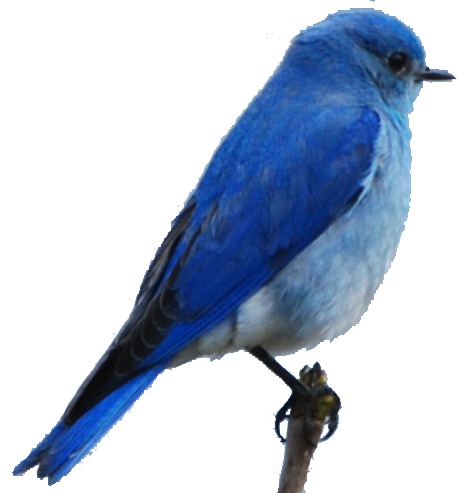 predictive models for bird presence and abundance) to support improve forestry practices that support conservation. They also look to improving their models, which always require field-testing and revision. At some point in the workshop, I noted that, the overall workshop title could have been “forestry, modelling and the Canada Warbler. Canada's lone desert, the South Okanagan-Similkameen, is a unique landscape of dry grasslands and open ponderosa pine forests in southern British Columbia. The area has more endangered species than anywhere else in the province, including creatures found nowhere else in Canada such as Lyall’s Mariposa Lily, Flammulated Owl and Great Basin Spadefoot Toad. Other animals natural to the area, like the Burrowing Owl, Sharp-tailed Grouse, and White-tailed Jackrabbit, have already been lost due to habitat loss. 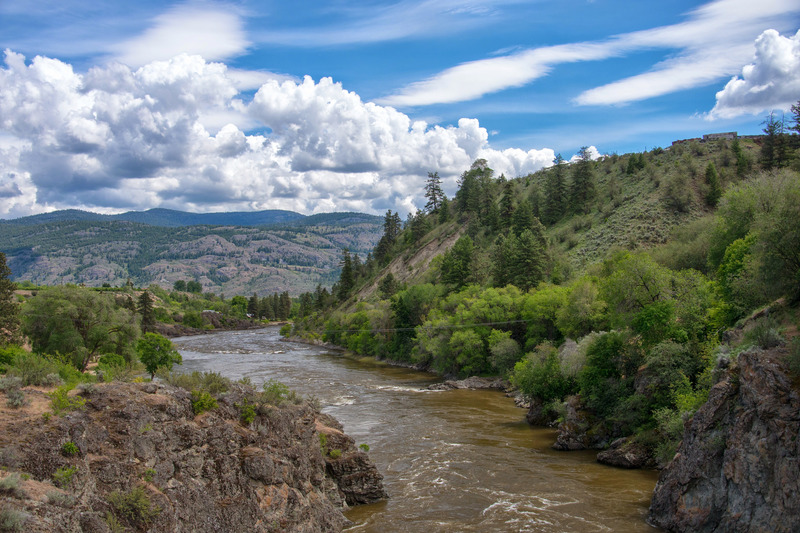 As development continues in the Okanagan, we need to permanently protect this unique treasure with a new National Park Reserve. You can probably guess who lives in Bighorn Country - Bighorn Sheep! It's also a home to Grizzly Bears, Mountain Goats and Bull Trout. The area of the eastern Rockies adjacent to Banff and Jasper is the missing piece between the two parks and needs to be protected to allow these iconic species room to roam. The area is the source to both the North Saskatchewan and Red Deer rivers, which provide drinking water to more than 1.5 million Canadians across the western provinces, including the city of Edmonton. Despite this, it's still at risk from development pressure. 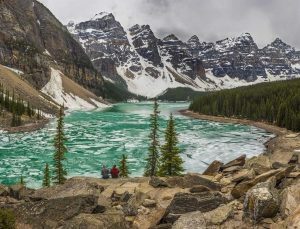 The Alberta government recently announced a plan to create a new Wildland Park and three provincial parks in the area. We have the opportunity to make sure the area is protected for future generations of humans and animals. We need your help now during the public consultation phase. 1. 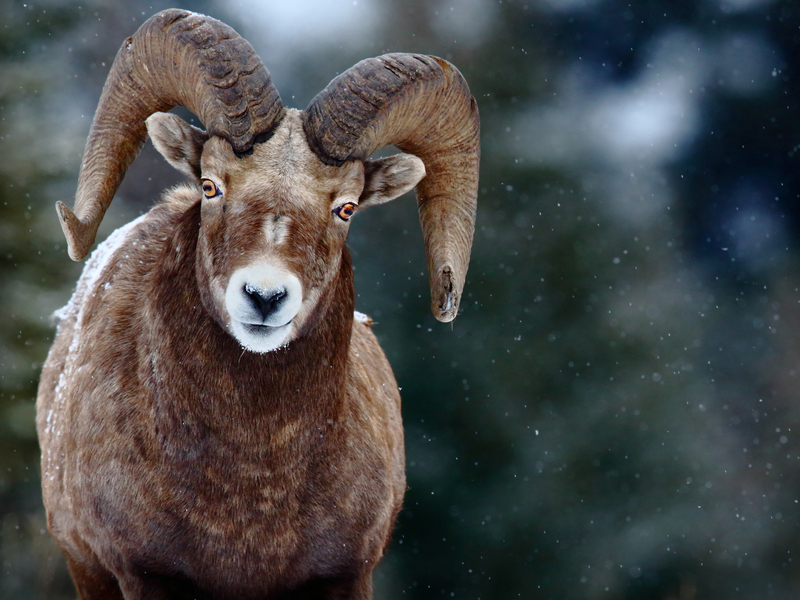 Sign our petition: Say YES to Bighorn Country! (5 minutes) Join thousands of Canadians and tell the government that the Bighorn Country needs protection now. Sign now! Spanning two provinces and bordering the territory of Nunavut, the coast of James Bay and the North French River watershed has supported a wide array of wildlife and the traditional culture of the Moose Cree Nation and Cree Nation for millennia. In Ontario, the water from the North French River is clean enough to drink. However, the area is at risk from prospective industrial activities like logging and mining that threaten the purity of its waters. The North French is home to species at risk such as Boreal Caribou, Rusty Blackbird, Olive-sided Flycatcher and Common Nighthawk, as well as an abundance of migratory birds and fish. Nature Canada stands with the Moose Cree First Nation in Ontario and the Cree Nation Government in Quebec, who are leading efforts to protect this rich habitat of towering pines, swift rivers and arctic waters. 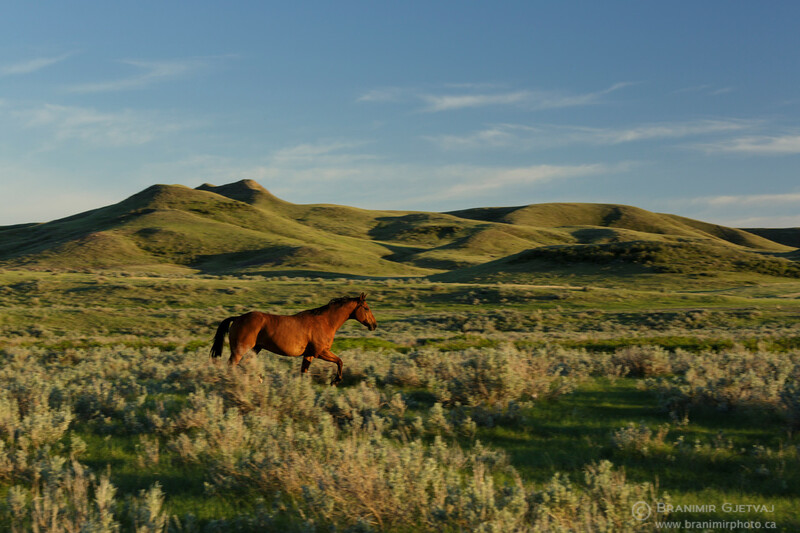 It might come as a surprise that the most endangered landscape on earth isn’t Brazilian rainforest - it’s actually prairie grasslands. Rolling hills, natural stone sculptures and life-giving waterways make up this unique landscape in southwest Saskatchewan and southern Alberta. These heritage ranch lands are some of the few remaining places that provide habitat for an incredible number of unique species, including the Greater Sage Grouse and the Pronghorn Antelope. These animals already have homes in the Milk River Watershed and South of the Divide in areas such as Govenlock, Nashlyn and Battle Creek Grasslands in Saskatchewan and the Suffield Community Pasture in Alberta. Continued ranching - a practice that replicates natural bison grazing - is an important part of keeping this landscape healthy. Far from the shore of BC and more than four times the size of Vancouver Island, an otherworldly seascape of underwater mountains and fragile coral forests exists below the surface. 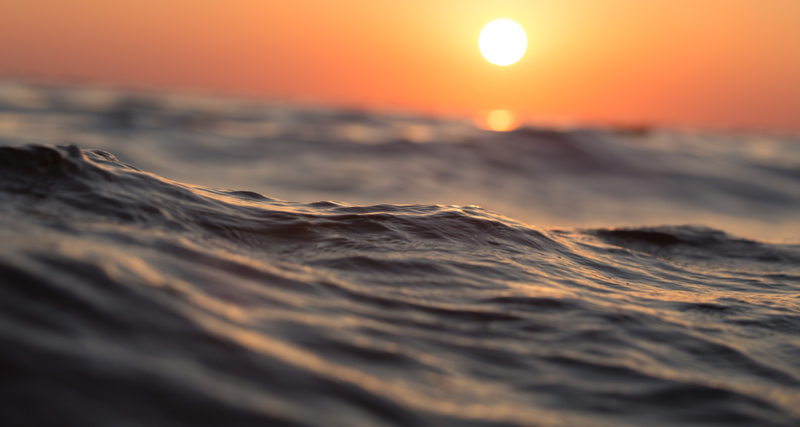 The area (officially designated the Offshore Area of Interest) supports 13 individual marine mountains - all stretching over 1000 metres from the seafloor - that are ocean oases supporting complex ecosystems. They are literal hotspots for sea life, where hydrothermal vents release billowing black smoke and nutrient-rich water superheated by the earth’s core. The vents and mountains are a gathering place for sea life. From microscopic creatures all the way up to octopus, rays, sharks, whales and dolphins. 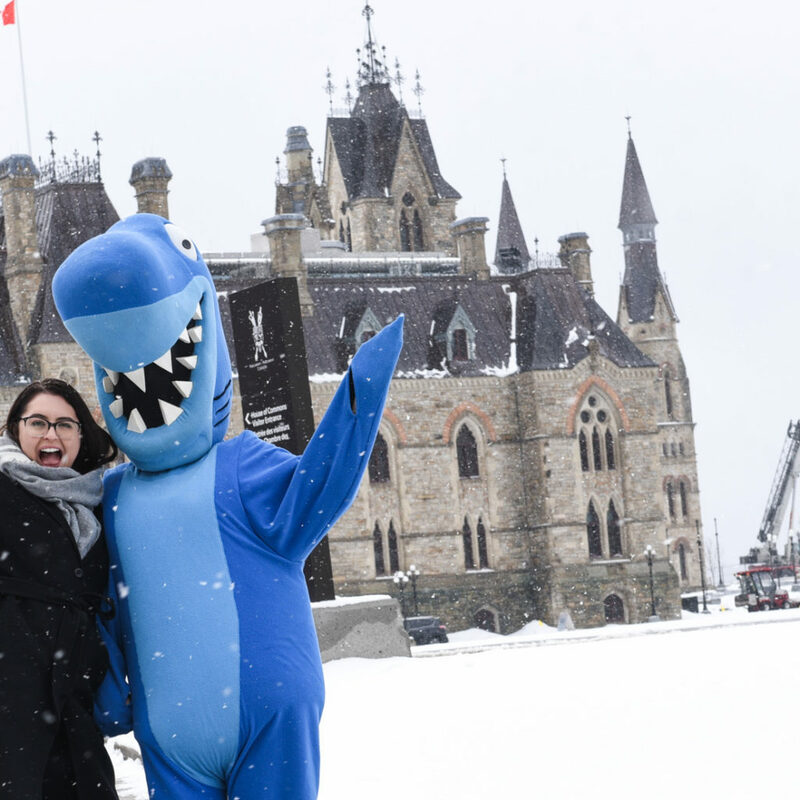 Making this area full Marine Protected Area with restrictions on oil and gas is a chance to protect fragile seamounts, preserve the area for future scientific exploration and move a step closer towards Canada’s 2020 target for marine protection. Thank You for Caring for Nature This Holiday Season! [caption id="attachment_33387" align="alignleft" width="150"] Jodi Joy, Director of Development[/caption] As we ring in the joys of the holiday season and look with gratitude to another new year, we often reflect on the key moments of the past year, whether through lists on TV or in the paper or read online. With every member who shares their nature discoveries, memories or wishes, I’m reminded again and again how much nature nurtures our souls. It also reminds me why our members feel it’s important to defend wildlife and wilderness. It’s truly inspiring and heartwarming to know that you care dearly about nature. Thank you for your kindness, compassion and dedication to nature this past year. Your generous support is always hard at work to defend animals, plants, and the clean air and water we all depend on. 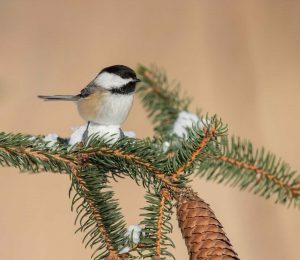 At this sharing and caring time of the year, you might enjoy these reflections from your fellow Nature Canada members that hopefully will put a smile on your face as you read and nod along: “Nature is a never-ending source of inspiration, restoration and discovery for me. I think for all of humanity, when one opens their eyes and heart to it, from a single wild bloom in an urban field to the broad majesty one encounters on a mountain hike. 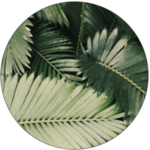 So much to discover and care for.” – Dorothy, BC, member since 1999 “I find solace in nature — the woods, fields, swamps, running water, rocks and cliffs are like cathedrals. Birdsong and glimpses of wildlife connect me to the living web that sustains us all." “I still remember watching the morning mist and hearing the loon’s cry at the lake for the first time as a little girl sixty years ago, like it was yesterday.” – Marion, ON, member since 2013 “After camping for nearly half a century … I still love it so! 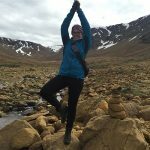 My wish for our beautiful country is that Canadian nature be protected, nurtured and respected more than before and that the generations that come will understand and appreciate the importance of this vital symbiosis.” – Julie, QC, member since 2003 “We say nature like it’s something separate from us. We are nature, we are part of wilderness, we must protect nature to protect mankind.” – Gisele, ON, member since 2003 “My wish is that every Canadian be grateful for all that is great about our magnificent natural heritage.” – Ann, AB, member since 1998 “I hope that Canada’s citizens vow to work together to protect and expand our remaining wild spaces. We need to protect our biodiversity. We need stronger environmental protection to do so. 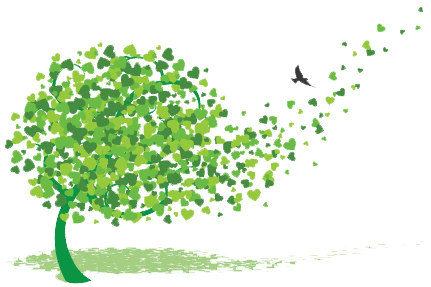 Every form of life in Canada deserves clean air, water and soil. That’s our commitment for the next 150 years.” – Karen, ON, member since 2001 As we look forward to 2018 (oh my gosh, where did the last year go?!) — an enormous THANK YOU to all of our members who stand alongside us to be a strong voice for nature. You and I can be thankful for all the gifts nature provides. "The greatest gift we can give to each other this year should be … an ongoing commitment to preserve and protect our precious wildlands!" [caption id="attachment_30818" align="alignleft" width="150"] Jill Sturdy, NatureHood Program Manager[/caption] Earlier this week, the Honourable Judith Guichon, Lieutenant Governor of British Columbia, unveiled a plaque that officially designated the grounds of Government House a Nature Canada NatureHood site. [caption id="attachment_35546" align="alignright" width="316"] Bob Peart, Nature Canada's Board of Directors Chair and the Honourable Judith Guichon, Lieutenant Governor of British Columbia[/caption] As a Nature Canada Honourary Women for Nature member, Her Honour has a strong passion for encouraging children to explore nature. 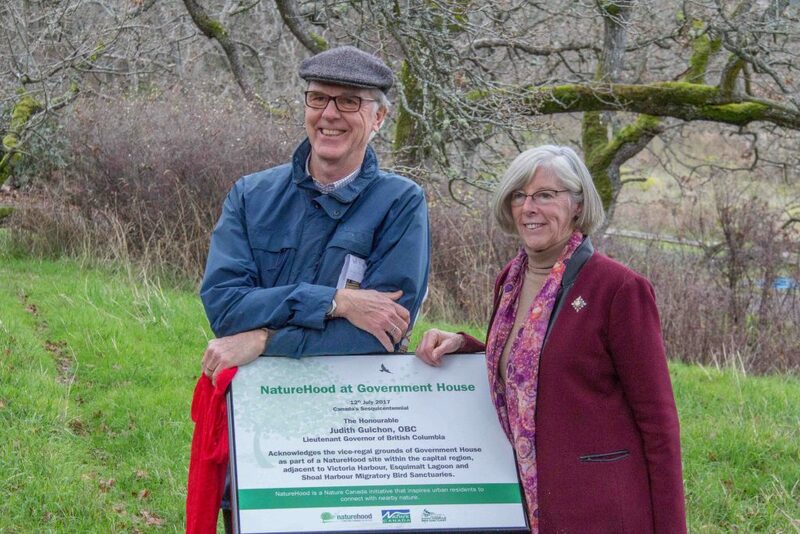 Thanks to her leadership, the NatureHood plaque will help inspire visitors of the Gardens to explore and connect with nature. The Government House gardens are located on the traditional territory of the Songhees and Esquimalt First Nations. Open to the public year-round, they are an ideal place to inspire BC residents and visitors to connect with nature to appreciate this remarkable and unique part of Canada's heritage. 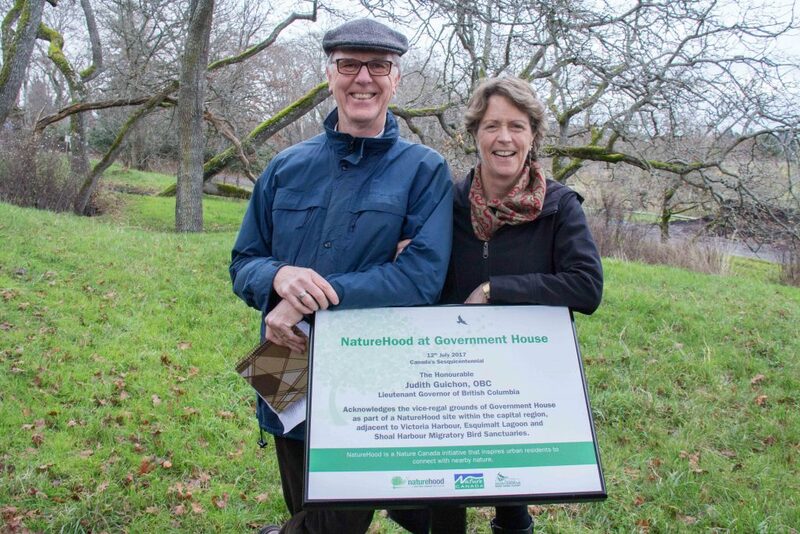 The NatureHood plaque is located at the trailhead of the Woodlands trail, which features native plants of British Columbia, including unique Garry oak habitat. Government House is located within the Victoria capital region NatureHood, adjacent to Victoria Harbour and Esquimalt Lagoon and Shoal Harbour Migratory Bird Sanctuaries. [caption id="attachment_35545" align="alignleft" width="303"] Bob Peart, Nature Canada's Board of Directors Chair and Sue Staniforth, President of FOSH[/caption] NatureHood is all about inspiring urban Canadians, especially youth, to explore Nearby Nature and help to foster a new generation of nature lovers. 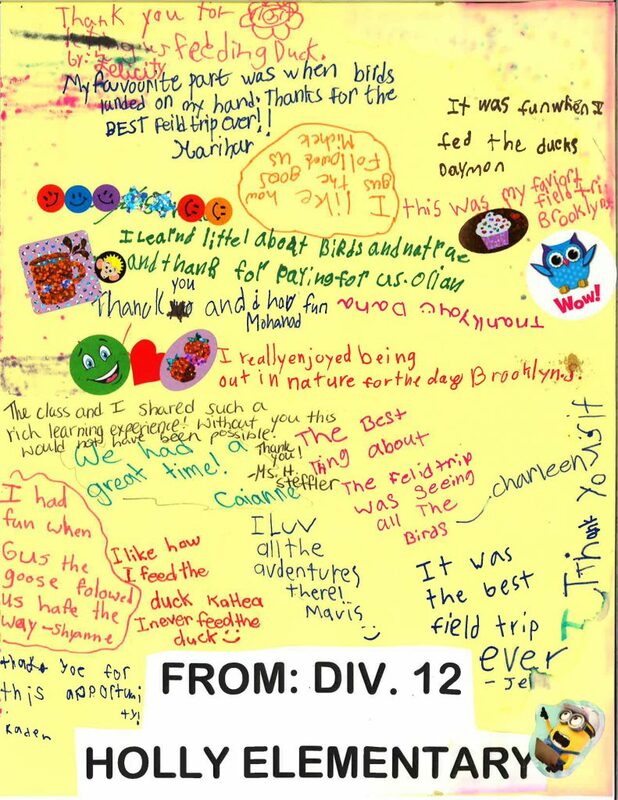 Working closely with grassroots naturalist groups, such as Friends of Shoal Harbour (FOSH), NatureHood promotes nature through celebratory events, educational and stewardship activities and wildlife observation. 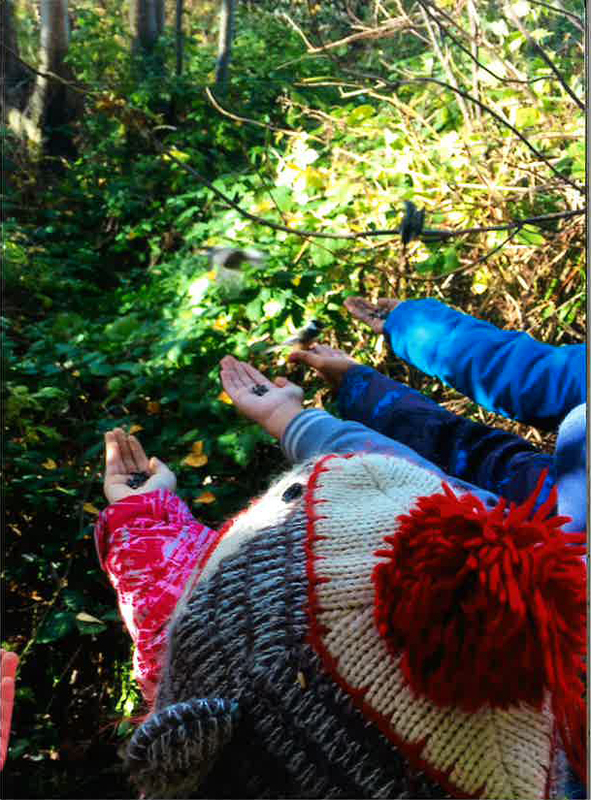 Friends of Shoal Harbour (FOSH), our local NatureHood partner in Victoria is active in providing nature-based educational activities to the public through events such as All-Buffleheads Day, and leading school groups through the Migratory Bird Sanctuaries in the Victoria capital region. Next time you’re in Victoria, visit the gardens of Government House and explore nature in the capital region! 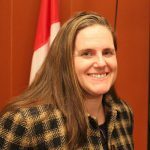 and General Counsel[/caption] Nearly all of Canada’s protected areas report deficiencies in capacity and resources for site management and monitoring says a December 19, 2017 report on Canada’s environmental performance authored by the Organization for Economic Cooperation and Development (OECD). “Many protected areas operate without up-to-date management plans. Most government organizations for protected areas report on programme-related performance measures, but few assess effectiveness.” The OECD also concludes that the terrestrial area under protection in 2015 (10.6%) is the fourth lowest of the 35 OECD member countries. 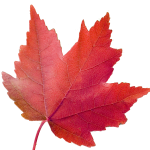 Under the UN Convention for Biological Diversity, Canada is committed to protect at least 17% of land and inland water by 2020 (one of the so-called Aichi targets). 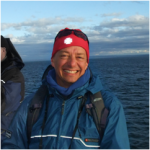 The OECD also concludes that Canada “will need to considerably accelerate the pace of establishing protected areas or other effective area-based conservation measures to achieve this commitment”. This is exactly what Nature Canada and the Green Budget Coalition have been saying. 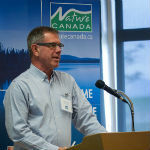 Nature Canada and GBC are demanding a budget for nature from the federal government in February 2018 that allocates $1.4 billion over three years to establish new protected areas, to allow Canada to meet our Aichi target.